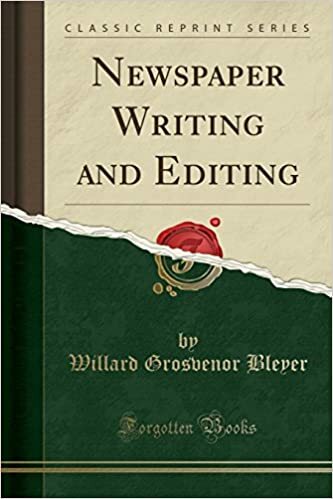 It is assumed throughout this book that the student of journalism is familiar with the elementary principles of grammar and rhetoric, and has had sufficient train ing in composition to be able to express ideas in simple, correct English. Faults in such rudimentary matters as grammar, spelling, punctuation, and capitalization are not considered at all. No attention is given to die tion or questions of good usage. All these matters are fully treated in numerous books on English composi tion. In the discussion of the news story, an emphasis has been given to the lead that may seem disproportion ate. This has been done in the belief that the rapidity with which newspapers are generally read makes the beginning the most important part of the story. The average reader gleans the significant facts of each piece of news from the headlines and the first paragraphs. He expects in the lead the feature as well as the gist of the news. To the student this problem of mass ing skillfully, in a compact and interesting form, the substance of his material, is a new one, and he must be shown all the varied possibilities of this treatment. The author has not been unmindful of the fact that efforts are being made to break away from the gist-of-the news beginning, and has given examples of forms. For stories in which entertainment rathe information is the purpose, beginnings that do ﬂsum marize may undoubtedly be used to advantage. In such stories the student must be shown how to arouse the' reader's interest and curiosity in the first sentences so that he will read further.